Charoite is a wonderfully unique and beautiful semiprecious stone in gorgeous shades of purple, lavender and grey. 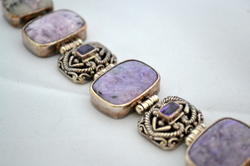 Learn more about charoite and its properties here. One of the most beautiful and intriguing semi-precious stones in the world - at least in this author's opinion - is the beautiful lavender-purple stone known as Charoite. Charoite is actually a rare mineral found only in one specific region of Russia, therefore many have never heard of it before, or have only recently become aware of its unusual appearance and stunning colors. Charoite can be featured in many different jewelry designs from stunning silver or gold-set rings, necklaces and bracelets to original and creative beadwork designs. I fell in love with charoite the first time I ever saw it, and have enjoyed working with the stone in my own jewelry work ever since. This page will tell you more about this amazing and attractive stone, and feature lovely Charoite jewelry you can by for yourself. You can also buy Charoite beads and rough stones for your own jewelry designs, and discover the pleasures of working with this amazing material yourself. Charoite is a mineral with the chemical composition (K(Ca;Na)2Si4O10(OH;F)H2O). It is correctly pronounced "CHAR-oh-ite" and is quite rare indeed, having to date only been found in the Sakha Republic, Yakutia, Siberia, Russia. It is named for the Chara River, where it was discovered. 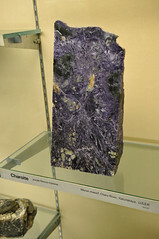 According to wikipedia, Charoite occurs "where a syenite, the Murunskii Massif, has intruded into and altered limestone deposits producing a potassium feldspar metasomatite." Charoite was first described an introduced to the world beyond Siberia in 1978, although some note its discovery may date back to the 1940s. It is primarily lavender-purple in color with swirling, fibrous textures which can exhibit beautiful chatoyancy. Charoite can also include black Augite, grey Feldspar and even orange Tinaksite inclusions, adding to its unique appearance. 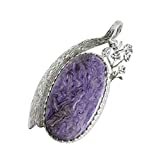 For jewelry and ornamental purposes, the most prized and highly valued Charoite is primarily light lilac purple with few inclusions and a strong chatoyancy, but of course you can and should choose pieces based on your personal taste. Many pieces and beads of darker purple Charoite with black inclusions are visually striking and attractive. Those who use stones and minerals for their healing and metaphysical properties will find Charoite a powerful mineral to add to their collection. It is considered a "stone of transformation", one that promotes transforming negative energies and emotions into positive ones. Charoite is a good stone for someone wishing to make significant changes in his or her life or just beginning on a new enterprise, job or activity. It is a stone to inspire creative energies and discourage nightmares and negative thoughts. Physically, it is believed to help with ailments such as headaches, liver problems, alcohol detoxification, cramps, heart disease, eye problems, and nervous system. X11765 Charoite 925 Sterling Silver Plated Necklace 19"
Am I Buying the Real Thing? Because charoite is becoming more and more popular, there are a lot of disreputable designers and manufacturers mislabeling cheaper materials as charoite. 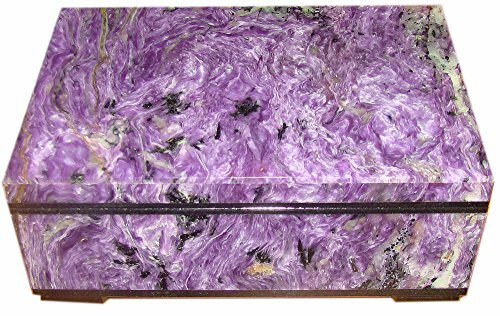 As this article points out, sometimes flourite is being sold as charoite as, if cut a certain way, it might appear to have the white, orange, black and grey patterns of charoite. (See also this report on fake minerals and stones; "Chinese Charoite" is NOT real charoite.) Other materials which are often called charoite but absolutely are not include purple kiwi jasper, purple crazy lace agate, purple howlite, and purple magnesite. Of course the best way to know you have the real thing is to be able to shop in person for stones and jewelry. When you can really examine the stones you can check for the color more accurately, the chatoyancy effect, and other factors which separate the real materials from the fakes. But it's not always possible to shop that way, and often Amazon or eBay is a more practical way to shop. However, fakes are especially rampant on eBay, but I have also found some great deals on authentic charoite jewelry and beads there as well. Be sure to examine photos closely once you've learned to recognize real charoite, and study return policies in case you discover that a piece you bought is not really what it claims to be. Charoite healing properties. Charoite is a birthstone for the zodiac signs of Scorpio and Sagittarius. Charoite is a gemstone for the heart chakra, third eye chakra and crown chakra. Charoite is one of the few gems that is so distinctive in its color and patterns that a gemologist can feel justified in making a "sight" identification. Charoite Stone Inspires Service To The Light & To Others. Learn how Charoite Stone protects you from psychic attack and strengthens your connection with the Supreme Being. A wonderful stone for healers who want to be of service to others. Charoite, information, pictures of rough and polished stones, healing properties and jewelry. The second video above, despite the admittedly "overdramatic" narration, gives some great close-up views of high quality charoite stones in jewelry. It's worth looking at to get a real feeling for the material and how it should look - to help you identify the real thing from the fakes out there. What Stones and Materials Combine Best with Charoite? Charoite is a very versatile stone, and with its color variations it can blend beautifully with many other semi-precious stones and materials. Amethyst, onyx, turquoise, citrine, peridot and freshwater pearls all can harmoniously work with Charoite, as can the lovely olive green stone Seraphinite, also from Siberia which exhibits similar chatoyant properties to Charoite. Charoite is more typically set in silver than in gold, although either metal can set it off beautifully. 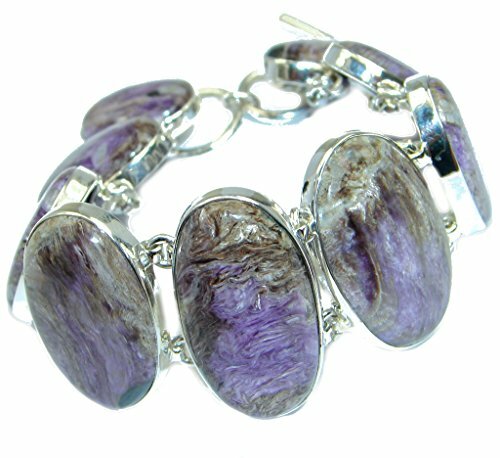 If you're shopping for charoite stones and beads, quality is important and should of course be reflected in the price. Good quality charoite will have strong chatoyancy and exhibit an intense lavender-purple color. Many lower-grade stones will either be so dark as to be almost black, or have lots of grey or orange inclusions. Of course, sometimes the very dark purple charoite stones can be quite dramatic and pretty in jewelry work, so go for what works best with you. Whether your looking for finished jewelry or beads to make your own, here are some other places you can find charoite on-line. Search results for Charoite from Fire Mountain Gems. Lovely selections from Je Gem.com. Lovely pendants and pieces from Mineral Miners. A great source for those who like Native American designs and jewelry. Nice stones and cut beads from Earthstone. It's a lovely stone - I've been collecting pieces of it for years. One of my absolute favorites! Loved to read about this lavender gemstone named charoite. Purple jewelry looks lavish on a violet background. It will also look awesome on white gowns with purple embroidery.